Without a practice ground, Mackinac Island Honor Scouts in Patrol 7901 had no way to practice synchronizing the raising and lowering of the flags along the island’s “Avenue of Flags.” Because they are Girl Scouts, the girls took action to solve that problem. They purchased their own Avenue of Flags and had those flagpoles installed at a practice field at Camp Linden, the resident camp of Girl Scouts Heart of Michigan in Livingston County. The girls conducted bottle and can drives, held garage sales, and sold concessions at University of Michigan football and basketball games. Thanks to their hard work and the support of the Pinckney-Hamburg-Lakeland Service Area Girl Scouts, Mackinac Island Honor Scouts from Patrol 7901 can now properly show the flag of our country the honor it deserves. 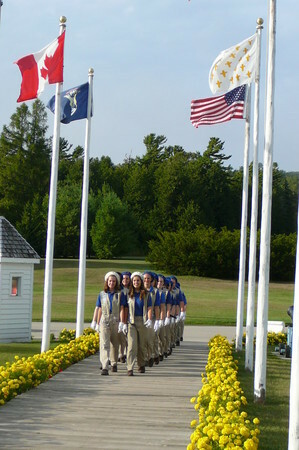 The Avenue of Flags at Camp Linden will also inspire patriotism in the thousands of girls and families who camp there each summer. “When I first applied to become a Mackinac Island Honor Scout I thought it was just another cool Girl Scout camping experience,” said Allison Collins, of Saline, “but it is so much more. It’s a great way to serve our country and the experience of being in the corps teaches you so much. You learn how to conduct yourself professionally, how to manage conflict, how to deal with all kinds of people. We are like 60 sisters, living in the scout barracks and working together." Girl Scouts have been performing flag ceremonies and serving as tour guides on Mackinac Island since 1974, when the wife of then Governor William Milliken made it possible for girls to join the Boy Scouts, who had been working there since 1929. Four patrols of 15 girls each raise and lower the island’s 28 flags each day. The girls also stand at attention at various stations around Fort Mackinac, answering tourists’ questions about the history of the fort. When not on tour guide or flag duty, the girls clean trails in the national park and paint. Last summer, one group re-stained the scout barracks.